In a recent post, Brian Hornback expresses utter shock that Senator Robert Byrd (D-W.Va.) has come out publicly in favor of the nomination of Judge Samuel Alito to the United States Supreme Court. Others I have talked to express similar wonderment at how the “King of Senate Pork” and someone who is widely seen as “liberal” can support Alito. From what I am hearing, a whole lot of you are shocked and pleasantly surprised by this development. I, on the other hand, am not socked, surprised, or otherwise taken aback by this development. Those who are simply have not followed Senator Byrd’s career the way that I have. Say what you want about Byrd, two words that describe him and his personality are “old-fashioned” and “astute.” I don’t disagree that his pork-barrel antics are unacceptable, but I will say that in West Virginia, that kind of thing will get you votes. This is because it is hard for people there to see as pork some thing Senator Byrd devised in his head that may have secured for them a job in something other than a fast-food restaurant or a coal mine. When Republicans get elected in West Virginia (and yes, they do, and Bush won W.Va. twice) they don’t do so by complaining about “pork” and railing against Byrdist fiscal thought. This is because in West Virginia, if you do this, the odds are pretty good that at least one (and probably more) member(s) of your audience may have a job because of Senator Byrd. Does that mean that people in West Virginia are all liberals who love pork and want a welfare state? No, certainly not. Most people in West Virginia think welfare is dishonorable, and would rather work in a coal mine than have their family on the public dole. In the eyes of a lot of folks in West Virginia, however, any job is better than no job at all, and that includes a “New Deal” sort of arrangement like Senator Byrd might make. When good jobs are scarce, people will embrace someone they see as providing them. Pork it may be, and ethically questionable it certainly is, but Senator Byrd understands that reality, which is why he will probably serve in the Senate until he dies. The other thing Senator Byrd understands is that West Virginians are socially conservative. They might embrace his pork-barrel spending because it is seen to benefit the state and provide many people with work. He knows, however, that most West Virginians are church going, bible reading, God-fearing people. Prayer in school still happens in many parts of West Virginia, note that the ACLU hasn’t been successful in stopping it, perhaps out of fear for what might happen to the lawyers they send if they do. It is because of this underlying social conservatism that Senator Byrd supports Judge Alito, and he said as much in his speech on the Senate floor. Byrd also correctly interpreted what the role of the Courts is in our federal system, which is proof of a deeply ingrained social conservatism in his mind. I am not saying that Byrd is a conservative, not in the same way that I am or others that I know are. Byrd does, however, have a conservative social outlook. That is a reality I have known for years, and so Byrd’s actions are hardly surprising. In fact, when the GOP is in sore need of an extra vote here and there, I wouldn’t at all be surprised if Senator Byrd steps forward. He doesn’t get called “the loose cannon” by his own Party Leadership for nothing. Is it just me, or are there others out there who are as frightened as I am about the fact that Bredesen is about to appoint two more justices to the State Supreme Court, meaning that three of the five justices will be Bredesen appointees? Two separate stories, one in The Tennessean and one in the News-Sentinel leave me in a state of confusion about what is actually going on in Nashville. The News-Sentinel is hailing the latest developments as a breakthrough, saying that the House and the Senate are finally coming to some sort of agreement on ethics legislation, and essentially saying that the Democratic House Leadership has seen the light, and suddenly agreed to accept many of the tougher ethics provisions of the Republican-led Senate, most of which had to do with meals from lobbyists and how and when they could occur. The fact that we have to write up some legal code to tell legislators what is ethical seems to be a testimony to the reality that many of them lack common sense to begin with. I am in no way saying that all ethics are situational, but in the game of politics, situations where legislators have dealings with lobbyists often are pretty situational, and the question of whether something is ethical or not can usually be answered by legislators asking the question I mentioned above. All that our legislators are proving is that they either have no common sense, or something far worse: They lack a sound conscience with which to make good ethical decisions, and so a law must be drafted to tell them how to behave. These are not representatives of the people. They are overgrown children whose playtime is being funded with taxpayer dollars. They should simply rename the State Capitol the State Adult Day Care Center. Supporters of an income tax in Tennessee, led and financed in large part by big labor, are again running their mouths claiming income inequities in Tennessee. They claim that the tax on food is too high and penalizes the poor. On that point, I agree-I think that there should be no sales tax on food bought at the grocery store. The fact is that the cost of living and the price of land statewide are notoriously low, so much so that a lot of people are moving here to live cheaply and buy land more cheaply than the places from which they came. The low cost of living here actually makes conditions better for those who make very little money. I know this is a reality because I know it from past experience, and from having lived in states that had the "fair" taxation system these "fiberals" envision. If you've never experienced having your meager income taxed at all levels, (federal, state, and local, and depending on the locality, city as well as county) I can tell you that paying income tax can literally lower your standard of living-it can and will make the modest man a poor one. I won't get into how the progressive income tax came out of the Communist Manifesto. I will not explain how some of these people really want a socialist arrangement, where the poor remain poor, the middle class gets poor, and the wealthy are just destroyed-and the ruling class, which I imagine in the ultimate liberal vision would be the Democratic Party, would live as kings. I will only say that if you support an income tax in Tennessee, you are telling the poor and middle class to stay poor or "average." Why? Better yourselves, and the government will tax it away. This twisted vision of Tennessee's future must be rejected, and if it is not, those who force it down our collective throats must be made to pay. Next Canadian Ambassador: The Right Honorable Preston Manning? The rumors are swirling all over the blogosphere that Preston Manning, friend of America, founder of the Reform Party of Canada, the man who has waited longer than anyone else for a Conservative victory in Canada, will be the next ambassador from Ottawa. Upon hearing the rumor, I nearly jumped with glee. This man makes President Bush look like a left-wing maniac. In fact, Manning could teach Bush a thing or two about what it means to be a conservative. I think the thing I most admire about Preston Manning is that he is a really rare bird in today's world. He is a Christian statesman...from a family of Christians and statesmen. Even John Manley (former Liberal Deputy Prime Minister) once admitted that Ernest C. Manning, Preston's Father(and a minister), ran the cleanest and most honorable government in Canada when he was Primier of Alberta. Both Manning's people and Stephen Harper are offically denying the rumor. Just so regulars know, I was offered a professional position today here in Knoxville. I have yet to officially accept the offer, largely because the offerer made the unusual request of asking me not to accept the position right away. I was told to talk it over with my wife and family. I did, the conversation took about ten munutes, and Nicole was of the opinion that I should take the offer. Needless to say, I am of the same mind, and was ready to say yes even before consulting with my beloved. I have to admit, though, it is some comfort to know that a potential employer cares enough about families to want you to ask your wife before saying yes to a new job. Acceptance of these new responsibilities, which will commence some time next week, will likely mean that we will be on a "one entry a day" schedule except on weekends, although there may be more from time to time as my schedule allows. I just thought my regular readers and people who have indicated that they support what I do here should know. 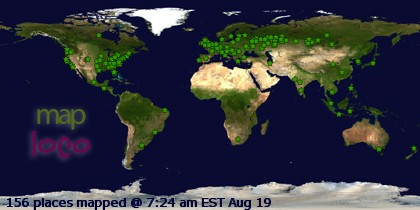 The World is not going inactive. I just wanted to give folks a heads up. You've gotten used to multiple posts each day, and after next week, one a day just might be the norm for awhile. Christians of Knoxville, you have much to be proud of today. I am convinced that because of you and teaming millions like you around the country, NBC has cancelled the blasphemous program The Book of Daniel, which glorified ungodly behavior by an Episcopal priest and his family, and mocked the Holy Name and character of Christ Our Lord. As you will recall, back when the controversy over this prime time fare from Hell began, I called for the boycott of our beloved local NBC affiliate WBIR after station management refused to pull the show in spite of numerous requests to do so from the local community. I certainly wasn’t the only one calling for a boycott, so I believe that the combined efforts of many, not just here in Knoxville, but all over America, helped put an end to this shameful exercise in television cruelty. I did notice that many Tennessee bloggers who had a link to WBIR in their sidebars removed that link after I called for the boycott. I can’t say whether my calling for a boycott urged them to do this, or whether their anger was ignited the same as mine, but I do know the effort was effective. For their part, NBC is claiming that the program was cancelled due to poor ratings, not because of the controversy surrounding The Book of Daniel. I don’t suppose the folks at the network stopped to think that the ratings were poor because of the controversy, that there were no ratings because a lot of people were boycotting the show (perhaps even their local NBC station). No…they can’t bring themselves to admit that Christian America united and gave NBC and its affiliates a good whippin’. They were put in their place by a bunch of Christians in Middle America, and it is eating them alive, I am sure. I am heartened and warmed right down deep in my soul that a few good people out there besides me are still willing to fight the Culture War. The Culture War is more important than any other fight we may wage. The “war on terror” is a fight against militant Mohammedans. The Culture War is the war for the very soul of America. If we lose it, we will lose our country, for blessed is the nation whose God is the Lord, and cursed is the nation who rejects Him. As for WBIR, station manager Jeff Lee claims “the system works” and says the show was highly rated here in Knoxville. Based on what happened, I am not buying Lee’s tale. However, WBIR has been restored to its sanity by an executive decision. As a result, WBIR returns to its rightful place today on my blog sidebar. Some readers who have looked at my blogger profile might be asking "what on earth is the Cyberian Broadcasting Cooperative?" The question you are really asking is "what on earth is Cyberia?" Cyberia was founded in 1997 as a project by a 17 year-old high school kid named Ken Kerns. He wanted to see if it would be possible to create a unique political culture on the internet. At first, it was taken over by a bunch of college kids who made it their occupation with which to cure boredom, of which I was one. Over the years, the simulation has matured as we have. Some of us, myself included, have gone away from it at times as life directed (in truth, after all, it is a simulation…a game). Something ticked, though, as it is still around. Cyberia has gone through some tough times of late and I was asked, with the understanding that I have a limited amount of time to do so, to come and help lead a revival of sorts. If any of my readers are interested in joining Cyberia, just click on the link above. It has always been my opinion that the place could use more conservatives, but the more people who join, the less load on us old veterans of the place. Younger folks interested in political systems from around the world might want to give Cyberia a try. Since any party needs 155 seats (one more than half) to govern with a majority, no party has enough seats to govern, even when forming a coalition government-unless that coalition is with the one party who holds the balance of power, the Bloc Quebecois. To put a (very) rough face on the Bloc’s standing in the Canadian federal system, the closest equivalent in our own system might be if the Southern Party held a quarter of all the seats in the House of Representatives. The Bloc doesn’t have quite that many seats, but they might as well…virtually nothing can get through Parliament without the approval of the Bloc. Although this is not the victory many Conservatives desired (they wanted a majority), it is nonetheless a victory, and they should be congratulated. We know it is a victory in fact, because Bloc leader Gilles Duceppe indicated he would stand by a Conservative government, so long as that government stood by the interests of Quebec. With the Bloc, the Tories can garner 175 votes…more than enough to make Stephen Harper the Prime Minister. The New Democratic Party, or NDP, is a socialist party that tends to be quite anti-American, has made some serious gains, however, and should be watched. Traditionally, the NDP, known in former times as the Cooperative Commonwealth Federation, has had the support of Canada’s many labor unions. The blatant anti-Americanism is a relatively recent historical development for the NDP (some would argue that it long existed covertly), who are likely playing the “American card” to gain political points. In some future Parliament, it may be the NDP that holds the balance of power and could turn a Conservative plurality into a Liberal government. I should say that I think no matter which party wins a plurality in Parliament, minority governments may be a fact of life for some time until the Quebec Question is permanently resolved, one way or the other. As long as the Bloc remains such a formidable political force in Quebec, they will continue to deny majorities to either the Tories or the Grits, and if history is any indication, these minority governments will continue to be short-lived. For Canada's own future stability, there must be a permanent decision on the status of Quebec. As far as the Liberals go, Paul Martin has said he will resign as Leader of the Liberal Party, but will remain a Member of Parliament. Believe it or not, much as I am not a fan of the Liberals, there is much to be learned from Martin’s action. His party has lost its mandate to govern, and he is taking responsibility rather than blaming others. Considering the circumstances regarding the downfall of the Liberals, there are plenty of others he could blame. No-as bad a leader as many argue Martin has been, in this regard, Martin is being very much a man. Republicans in Tennessee should do as Martin did. If our Party Leadership fails to field a candidate for Governor, and/or take control of the House and Senate, our State Party Leaders should also be men and resign. Some may ask why I take such an interest in the Canadian election, besides the fact that I have family in Canada and my grandmother was born in what, in 1949, would become a Canadian province. The reason is because we do more than share a border, we also share a heritage, especially with English-speaking Canada. History tells us that English is widely spoken in Canada today because some Americans took one side in a certain quarrel with the British Crown, and some took the other side. Most of those who supported the Crown went to Canada, which virtually overnight went from being a mostly French-speaking possession won by Britain in the French and Indian War, to having a huge English-speaking population, and was thus divided into Upper and Lower Canada. Our destiny on this continent is tied with Canada whether we like it or not, and Canada’s destiny is tied with our own, whether they like it or not, and it thus behooves us to take an interest in Canada’s political affairs. Beyond that, however, conservatives everywhere should support other conservatives, wherever in the world they might be. Today is election day in Canada, and the CBC reports that polls are open and a heavy turnout is expected in most places in that country as the weather is cooperating and is unseasonably fair. If the polls are any indication, Canadians are about to elect their first Conservative government in 13 years-it will really be the first government for a Conservative Party that is a mere shadow of the old Progressive Conservative Party. Polls now indicate that government may be an outright Tory majority, something that was unthinkable as the campaign began. I said in earlier posts that Tennessee Republicans have something to learn from Canadian Tories about relentlessly attacking corruption. The reason conservatism in Canada has risen from the dead (and I mean dead and buried) is because the corruption of the Liberals/left has been exposed. The fraudulent intents of the Liberals have been uncovered, and rather than ignore it, the right in Canada united and attacked the Liberals as one single powerful front. The people of Canada are still skeptical about whether the Tories are able to clean up government, largely because previous Tory governments do not have a stellar record on the corruption question. However, Tennessee Republicans as a legislative party do not have that problem...we haven't really been the party of power legislatively at all. People want a party that will do their level best to clean up the filth. Republicans need to unite as one against the Democrats and the corruption they have wrought on Tennessee for all these many years. The Tory Party is to be congratulated on what may be an unprecidented victory tonight. If they can actually deliver on some of their promises, they may become a more permanent political fixture, just like the Liberals who oppose them. State Republicans...pay attention. If the Canadian Conservatives succeed, they may be used as a model for our own party's future. For those of you with access to my personal contact information, you may note this morning that you cannot reach me at my cell phone during business hours, when it is normally always on. This morning it seems to have decided to give up the ghost. I am going to the Sprint store this evening. Work some magic for me, Sprint! Just a quick note of support to those who will be gathering tomorrow in Washington for the annual March for Life. I want everyone marching to know that my spirit marches with you, even if Nicole and I can't be there in person. I hope and pray that next year, we can join you on the Mall. I pray that the year will come when we will not need to march anymore. I went on the March on a cold day in 1998. Since that time, I pledged that one day I would return and bring lots of friends. If you, dear reader, are truly pro-life, I urge you to go to the March for Life in Washington at least once. It will strengthen your resolve to fight the battle for the innocent unborn who cannot march, but whose blood cries up from the ground against this land for justice. Let us march on until we win the final battle. Some very sad news out of New Haven, Connecticut: U.S. Repeating Arms Company, the makers of Winchester rifles (Model 70 and Model 94) is going out of business. The Belgian-based company that owns U.S. Repeating Arms decided to close the old New Haven operation founded by the late great Oliver Winchester. To be fair, Winchester is the victim of increased competition in the world of firearms, and as the cited article points out, in the 1960's, Winchester streamlined models and this led to a lot of Winchester efficianados to say that the weapon had declined in quality. It is a shame that, for example, many foreign gunmakers make a better modern weapon than our U.S. makers do. I own German-made guns and U.S. ammo...if you guessed Winchester, you're right. Winchester ammunition will still be manufactured, however, as a Missouri company owns the rights to Winchester's ammunition business, as well as the name "Winchester." What is sad is that the gun that is widely reputed to have won the West and helped settle large parts of our country will be no more. Winchester is a long-ignored and unrepresented part of our national heritage. It is truly a shame to see it go. Today I am speaking as a sports commentator. When I say I am speaking in that vein, I am speaking as someone who has had over six years of experience in real sports media and radio. I want to clarify that because what I am going to say in here is going to get me roasted by some of you in this town where, by certain people, Peyton Manning is held in a regard only slightly lower than the Lord Christ. I also want to clarify that I differ from certain of my former associates in the sporting press: I actually like Peyton Manning. Archie Manning is the biggest whiner I have ever seen in the world of sports. The man makes Barry Bonds and Jason Giambi looks like saints when it comes to his handling of the press, and Peyton and Eli are not much better. Why do I say this about Archie? Archie is angry over Terry Bradshaw's comments about Peyton Manning's handling of himself at the post-game press conference after the Colts got whipped by the Pittsburgh Steelers. Peyton complained about the lack of protection from his offensive line. In doing so, he began his remarks with "I hate to sound like a bad teammate but..." Thus, sounding like a bad teammate is exactly what Peyton did. He broke the cardinal rule of being on a team: Wins and losses are taken as a team. As the quarterback (field general) he bears primary responsibility. What he said about his offensive line was true, but you chew them out for that in private away from the cameras. As for Archie's comments about the press always saying Peyton can't win a big game: Well, Archie, has the sporting press gotten that wrong? Tell us...what big game has Peyton won? In four years here, he failed to beat Florida, but Tee Martin did. He could not win a National Championship here...Tee Martin did. Now he can't even beat the #6 seed Steelers in a playoff game. By all accounts and by my own reckoning, Peyton is a far better quarterback than Tee Martin ever hoped to be. That just adds more truth to the very statement "Peyton Manning chokes in big games." He has proven this to be true time and again. Until he can prove otherwise, you can expect to hear such things about him in the press...especially when he makes assenine statements like he did after the Steelers' game. As for Archie, I have no doubt that he has raised Peyton and Eli to be fine young men, and he can be proud they they are both going to have great professional careers (Peyton's career already makes his father's pale in comparison), but they are big boys. They can take care of themselves. If Peyton or Eli aren't ready to handle criticism from the press, they aren't ready to be in the National Football League. As far as handling the sporting press is concerned, Peyton needs to grow up, and his father needs to shut up. Your boys are big boys now, Archie. If they can't handle words at their age without you butting in all the time, what will they do when you aren't around?